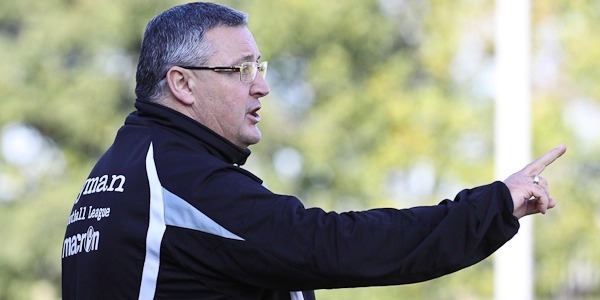 By his own admission Terry Spillane’s FA Cup history as either player or manager isn’t the stuff of legends but, now age 50, all of his Christmases appear to have come at once at Ryman 1 North’s Redbridge FC. The average cup run of even the giantest of giant killers tends to offer up one huge win, perhaps another surprise and then a series of wins over equal or lower league opposition. We’re not saying it’s easy to put in a long FA Cup shift but you need the rub of the green. Redbridge are doing it the hard way. Five games in to their FA Cup run and they’ve already had to dispose of three teams above them in the pyramid, one of them three tiers up. After beating Cockfosters in their first game, “it’s been four Cup finals in a row for us” said Terry. It has. Next up was Wingate & Finchley of the Ryman Premier League, newly promoted out of Redbridge’s division and they had doubled The Motormen last term. Being 5th in the Premier Division didn’t help Wingate as Redbridge brushed them aside 3-0 in a game that sounded like it could have been 5 or 6 apiece. No let up for the Motormen, drawn out of the hat against another Premier side, Bury Town, who were going even better than Wingate. Four wins on the spin and in the middle of a 10 match run during which they won 9. The one they lost? Well, of course, Redbridge, else we wouldn’t be here now. Ben Bradbury scored a sixth minute penalty and the Motormen hung on for 84 minutes for another famous win. In the 3rd Qualifying Round “Dunstable were keen to tell us they were unbeaten, you know, the usual mind games we all play” says Terry. A tier below but riding high, Dunstable held their own for the most part but cracks appeared in the second half and Redbridge ran out comfortable 3-0 winners despite some scares, including a saved penalty. Such a cup run often affects league form but Redbridge’s has been more patchy, which it has been all season, than bad. But if it has affected it, Terry wouldn’t change it “It’s the FA Cup, best cup in the world. We’d rather be in it than out of it. I mean, I don’t think we’re going to win it [the Cup], although I’m not sure yet!” We both laugh. I can’t quite tell whether it’s a devilish aside, or he’s harbouring sincere thoughts. Next up, the fourth and actual Cup final. Ebbsfleet might be just 20 odd miles away across the big river but they are 71 places and 3 tiers further up the pyramid. Instead of being Redbridge’s final effort, it turned out to be their best since they changed their name from Ford United (Port vale fans will remember them). They beat Liam Daish’s men 2-0 and a manager and squad of players had reached the propers. “Massive cup win” beams Terry, clearly very proud, and rightly so. “We’ve put Redbridge on the map”. When the draw came out, they were probably as disappointed as were Oxford City? A fifth cup final. “Well, I’d have loved to have got Brentford or Charlton, no disrespect to Oxford City they were probably thinking much the same”. “We had them looked at and we’ll be up against it, they’re top of the league. It’s a cup final again.” As Terry alludes, Oxford will be favourites, they are top of their league and that league is one step higher up football’s ladder. Clearly already some memories from this run, how about personal ones from the past? “West Ham 1 Arsenal 0 [1980 FA Cup final]. I’m a West Ham fan, Sir Trevor scored that diving header [his only ever one, said I], he was my favourite all time player and I was at Wembley with good friends. Cardiff [the best cup final of recent times, Liverpool 3-3 West Ham] was also good but Ebbsfleet is up there”. I told Terry that we do a poll every year, fans can vote for their non league team of the tournament and FC United and Hythe were the top two. “I followed their run, it was great” he said about Hythe. Does he think Redbridge will be winning it this year? He chuckled but gave nothing away. By the time this gets published, Terry’s troops will have had their final drill. We’ve no idea what’s going to happen but, either way, a non league side from at least the 8th tier of English football will be in round two of the oldest cup competition in the World! 3pm Saturday 12 November, Oakside Stadium, £10, concessions available. Thanks to Terry for sparing us a few minutes, Adam Dennehey for making it possible and Dave Horn for the photo.